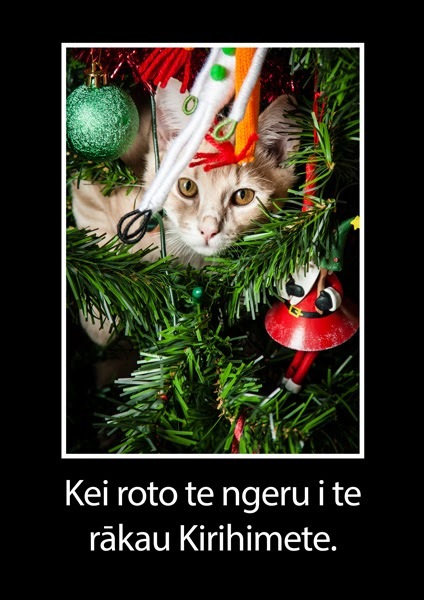 The cat is in the Christmas tree. The Te Reo component of my teaching Diploma was one of my favourite parts of the course. The visit to Ōrākei Marae was a huge highlight, but it was the language section that really engaged me. We did several sessions of total immersion learning using the Te Ataarangi method. It really whet my appetite for more and when I saw a similar course offered at the local college night school last year, I decided to give it a go. Three terms later, I know more than I did but am still very aware of how far I have to go. As the college no longer offers community education, I am hoping to continue my learning at another venue later in the year. Until then, I thought it might be fun to search through some of my old (and new) photos and attempt to use my (limited) Te Reo skills to caption them. Practice makes perfect!